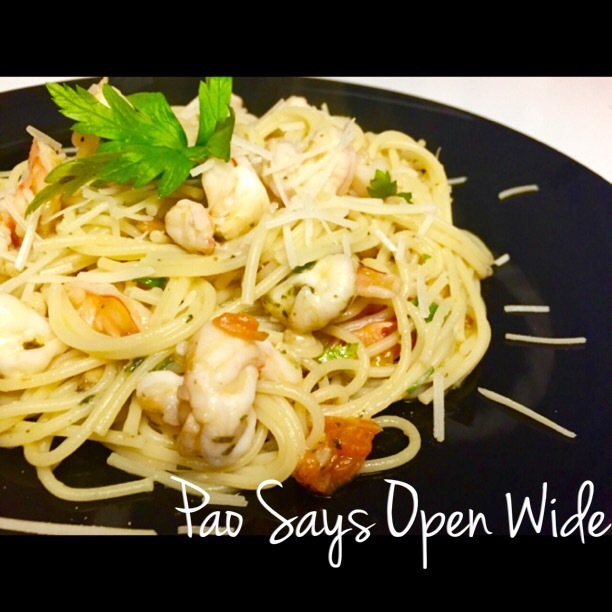 Quick, Easy, and Cheesy: Spaghetti with Lemon Garlic Shrimp – Pao Says, "Open Wide!" After celebrating my cousin Sandra’s birthday all day, I wanted to make a dinner that would be fast, easy, and super tasty. So I made a simple, flavorful, cheesy dish with three of my favorite things: shrimp, garlic, and, of course, cheese! This delicious pasta recipe focuses on bringing out the bright flavors in the few and simple ingredients it requires. I had a few tricks up my sleeve which I’ll share with you in the recipe below ☺️. AND, it only took about 20 minutes to make! #WIN! Defrost the shrimp in warm water. Begin to boil a pot of salted water. Chop 2 cloves of garlic, zest a half a lemon, and quarter about a cup of cherry tomatoes. Toss your pasta in the boiling water and begin to peel and cut the shrimp. When peeling and cutting the shrimp, get more bang for your buck by cutting them in half lengthwise. This essentially doubles the amount of shrimp you have! When your pasta is nearly cooked (about 3 minutes left to go), heat up some oil and about a tbsp of butter in a sauté pan and add the garlic, pine nuts, and tomatoes. Add the halved shrimp and the lemon zest- keep an eye on them though, they cook up very fast! Add the basil. I used these handy little frozen basil cubes I bought from Trader Joe’s. They also have these cubes for cilantro and garlic. They’re great because you don’t have to worry about your herbs going bad! You can make your own by chopping up some basil, mixing it with olive oil, and freezing them in small ice cube trays. Squeeze some lemon into the pan. Add about 1/2 cup of the pasta water to the sauce pan and then drain the pasta. Add it to the sauce pan and mix it together with the rest of the ingredients. Turn off the heat and add in a handful of shredded parmesan cheese. Mix everything together and then enjoy your awesome food! Woo!